“Our engineers will not lead by being repairmen,” said TED Fellow and social entrepreneur Dr. Ndubuisi “ND” Ekekwe. Ekekwe believes that Africa has the potential to be a leading innovator in the next wave of electronics design, in 21st century industries like nanotechnology and robotics. But to do so, Africa must reinvent the way it educates electrical engineers, software developers, and technology professionals across the continent. Ekekwe knows a thing or two about electrical engineering and education. At age 36, he holds four masters degrees (two from African universities and two from institutions in the US) and two doctorates, the most recent of which he earned from Johns Hopkins University. He has held the title of Banking Executive with Diamond Bank, Plc in Lagos, Nigeria, and runs a non-profit social enterprise, the African Institution of Technology. An inventor, author, educator, and advocate, Ekekwe was invited to deliver a TED Talk at the organization’s prestigious gathering of big thinkers in Long Beach last February. Ekekwe’s experiences in both the African and American engineering education systems opened his eyes to the barriers that the Continent’s universities must overcome if they are to prepare the next generation to lead in the high-tech industry, not just make a living. “In electrical engineering programs [at African universities], they teach you to understand how existing equipment works, but they do not encourage creative thinking or design. 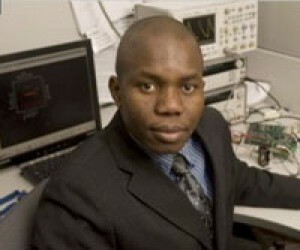 As for software developers, they can go through an entire four-year program and not understand how to program a basic circuit-board control mechanism.” Without this kind of deep, hardware-level knowledge, says Ekekwe, African programmers are at a competitive disadvantage with their peers elsewhere in the world, and behind the curve for the skills that will be demanded when the next wave of electronics innovations begins to break. Ekekwe’s advocacy for investment in new curricula and new technology is part of a broader effort aimed at turning Africa into the next world center of knowledge economy innovation. Two decades’ worth of investment in IT infrastructure and skills is starting to pay off, as the growing ranks of Africa’s Next Generation are starting to take their place in industry, government, and social development. Though significant barriers still remain, Africa is closing the gap more quickly than many thought possible. Last fall, SEACOM finally completed deployment of an undersea data cable to connect East Africa to the Internet at some of the world’s highest levels of bandwidth. Mobile telephony is growing faster in Africa than practically anywhere in the world, and for the first time, in 2009, web-capable “Smart Phones” outsold standard handsets on the Continent. Ghana, Kenya, Rwanda, Uganda, Tanzania and Nigeria are among the high-tech leaders, while South Africa continues to surge forward as a hub of innovation and a magnet for venture capital. All this new capacity is paving the way for a flood of entrepreneurial ventures that take advantage of Africa’s growing connectivity and expanding pool of high-tech talent. Unlike manufacturing, mining, and other “old economy” industries, high-tech has relatively low capital requirements and is not as dependent on physical infrastructure, where the historical legacy of underdevelopment has held Africa back. Talented entrepreneurs can connect directly with customers in the global market and to communities of their peers anywhere in the world, with fewer dependencies on local governments. The spread of networks has also created new ways to tie the talent of the diaspora to the rising fortunes of the Continent. Ory Okolloh, a Harvard-educated lawyer, returned to Kenya for what she thought would be a brief stay following her graduation. Instead, she became an activist and blogger at the center of Kenya’s contentious elections in 2008 – an experience which inspired her to create a new venture that uses the power of social networks, mobile devices and geolocation services (such as Google Maps) to develop an entirely new approach to crisis response. Her venture, Ushahidi, was developed almost entirely by African programmers, with the participation of the global “open source” community. The application is now used by growing numbers of disaster-relief agencies in Africa and around the world. Ushahidi was instrumental in providing support following the earthquake in Haiti in January, and in Chile in February. Advocates for African high tech development like Okolloh and Ekekwe emphasize the need for continual investment in new capacity to help refine the raw talent into a professional knowledge workforce capable of competing and winning in the global economy. A lot of capacity is forming organically, through indigenous entrepreneurship and private investment, but institutional support is still necessary. Ekekwe says he would like to see more public-private partnerships aimed at creating a center of excellence for hardware design somewhere in Africa. “We need a place where young engineers can create and test their own designs, as they do at the top schools in the United States and elsewhere,” he said. This kind of practical, hands-on design not only prepares engineers for high-value careers at global companies like Intel and Motorola, it also encourages bolder experimentation: the kind that leads to world-changing breakthroughs. He is careful to point out the distinction between innovation and fabrication. Ekekwe is not suggesting that Africa could overtake Taiwan and Singapore as centers of manufacturing , as the techniques of mass-producing integrated circuit boards are too capital-intensive and complex to invite competition. That’s the kind of math that Ekekwe believes can lift Africa’s economic fortunes. And that’s the kind of math he’d like to see added to the engineering curricula of Africa’s universities and technical academies. Rob Salkowitz is the author of three books, most recently Young World Rising: How Youth, Technology and Entrepreneurship are Changing the World from the Bottom Up, published by Wiley & Sons. He lives and works in Seattle, WA.